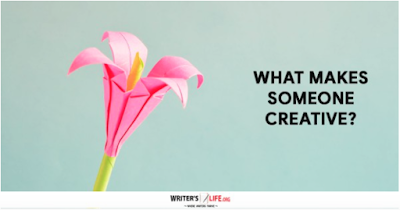 Creativity is at the core of what makes writers able to conjure up worlds, to bring chracters to life and to feed their reader's imaginations so that they immerse themselves in the story that the writer is telling them. I believe I once started writing stories because I could imagine different things. But now I seem to have trouble getting my ideas down once I imagine them. But I'm going to keep trying. I can see the ideas in my head, but sometimes they are hard to get down on paper. Finding the words to express what I have imagined can take time, but I will work to get it done. I guess I was meant to write because I can imagine characters coming to life and can hear the dialogue in my mind. 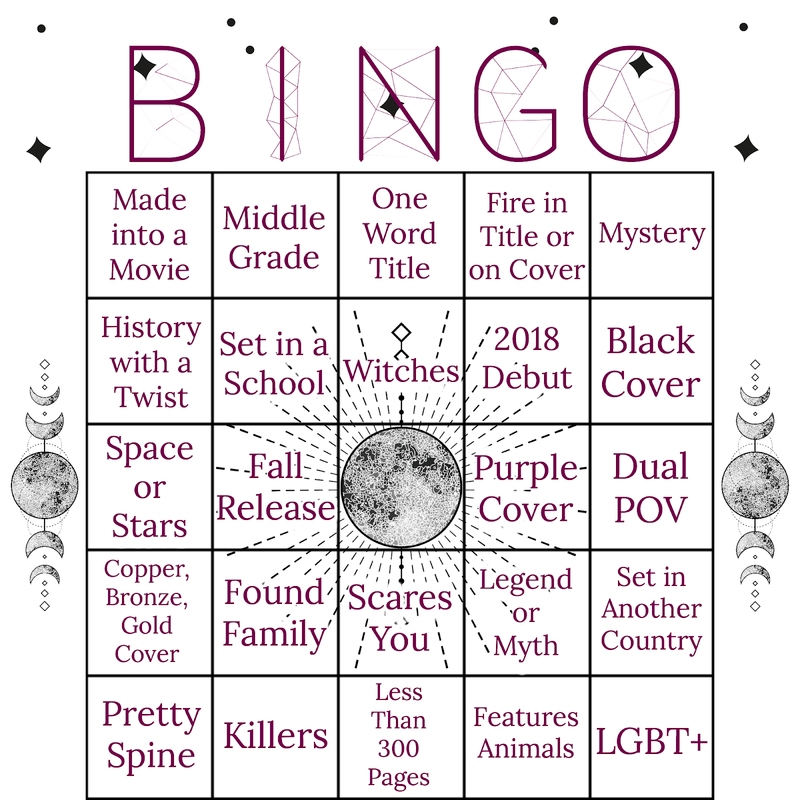 The Fall Bingo Card is up now at Pretty Deadly Reviews. It's that time again! 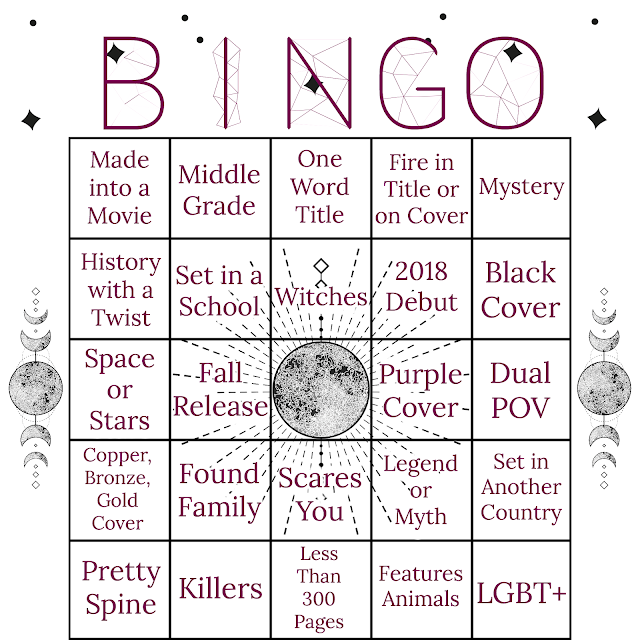 The most wonderful time of the year (Fall) coupled with a brand new Bookish Bingo card! I don't know about you guys, but I'm very excited about the upcoming months. I'm ready to watch scary movies and read spooky books and eat lots of good food - and have a baby! If you don't know, Bookish Bingo is a seasonal feature wherein we try to expand our reading horizons a bit and cover as much of the bingo card as possible. You can only use one square per book, and all books must be read in September, October or November. 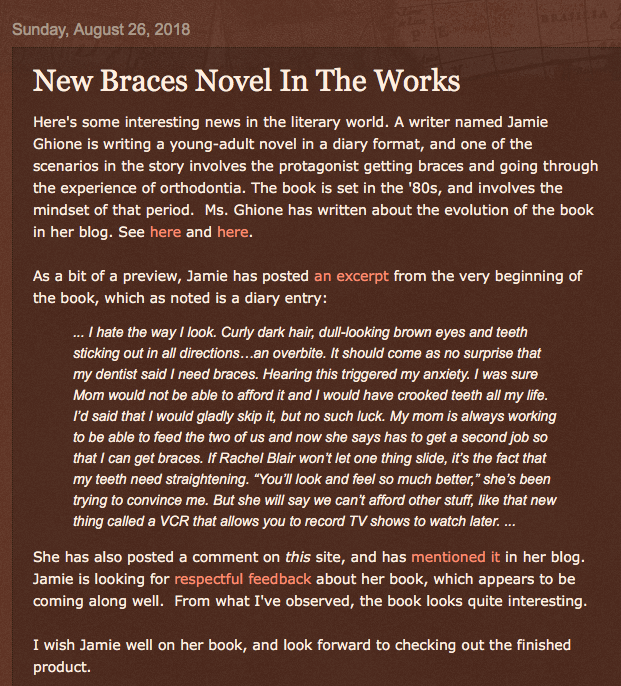 As I mentioned in this entry, I left a comment on this blog and then the blogger emailed me and I let him read a PDF of my WIP. A week ago, he emailed me with some suggestions he has made (also on this post). Doing this one again. It runs in September and October. I will be trying for the first level. Click to see more. 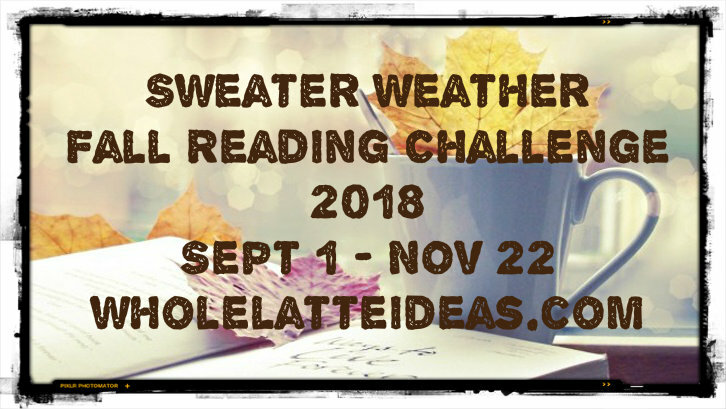 Announcing the Sweater Weather Fall Reading Challenge 2018! Here's a new one. This sounds fun and is very different. It runs from September 1 to November 22 (Thanksgiving Day). I love seasonal challenges. During the summer I hosted my Fun In the Sun Reading Challenge. For fall I've decided to create the Sweater Weather Reading Challenge. There's nothing I love more than to put on my boots, my favorite sweater, grab a mug of hot cocoa, and read a book. I particularly love to read books about being at school and fall themed cozy mysteries this time of year. Please note Halloween and horror books will not be included in this challenge. I will be creating a Halloween themed challenge that will be separate from this challenge. However, I do understand that many fall books overlap with the Halloween theme, especially cozy mysteries. These books may be counted for this reading challenge as long as they are not of the horror genre. Also, I decided to end the seasonal challenge on Thanksgiving rather than the end of November. I will be hosting a Christmas reading challenge that will begin on Nov 23. Look for info for that later this year. This season challenge begins Sept 1, 2018 and ends on Thanksgiving Nov 22, 2018. Books may be any genre except for horror. I will be creating a Halloween reading challenge for horror books. Books that may counted can have fall/autumn themed titles, the word fall in the title, the months of fall in the title, the word harvest in the title, be about school themes (fall is time to go back to school), have leaves, fall colored trees, apples, or pumpkins on the cover. Again, it's fine if these books mention Halloween or have things like a jack o' lantern on the cover. They can be counted as long as they are not the horror genre. If you want to see book suggestions please visit my Pinterest board of Fall/Autumn books. Books do not have to be read from these lists. I will be creating a 2018 new release list as well. Check back here for that link. If you could be so kind, please place the Sweater Weather Fall Reading Challenge banner on your blog to help spread the word. I finally was able to read your story, and I really enjoyed it. Thank you for allowing me a preview of the story. In particular, I really enjoyed the interaction between Martin and his school friends as he approaches getting braces, and then gets them, and is at first nervous, and finally shows up at school with braces. I thought all the accounts of his worrying about what other kids thought, and being aware of all the kids that had braces, and of those that picked on kids with braces. Also, the interaction between Martin and relatives and other adults was great. I found those to be great descriptions. If you dont mind, I have a few suggestions. One possible idea would be to incorporate more references to '80s popular culture, such as music and TV shows that were popular at that time. I do note that you referenced Kim Fields from Facts of Life... which was good. But maybe reference some musical interests of the diary writer... music was such a big deal for youth in the '80s, especially with MTV being so big. It would make sense that the diary writer would have made some comment about music and what was popular circa 1983. I remember it well, it was the era of synth pop like Eurythmics and Thomas Dolby ("She Blinded Me With Science"), and of Michael Jackson, and of Duran Duran... all of those were definitely big by the end of the year. Also, there were movies like ET (which came out in 1982 but was still influential by '83), and the final installment of the original Star Wars trilogy ("Return of the Jedi" came out in '83). In particular, I figure that a sensitive, shy, and awkward kid may have found solace in arts and popular culture. Stuff like music, and movies, and TV. Especially escapist type stuff that young boys enjoy...sci-fi, for example. I know this because I was an shy, awkward kid (in the 80s no less), and music and sci-fi always served as an escape for me. I could only imagine that as the diary writer tries to deal with his awkwardness and shyness... and things like having to get braces, that he would perhaps take solace in hiding out in his room and listening to music (as I did growing up), or in sci-fi movies or the like. It would perhaps add a bit to his personality. Also, as for the braces angle, there are even some movies and actors that had braces (like Kim Fields). 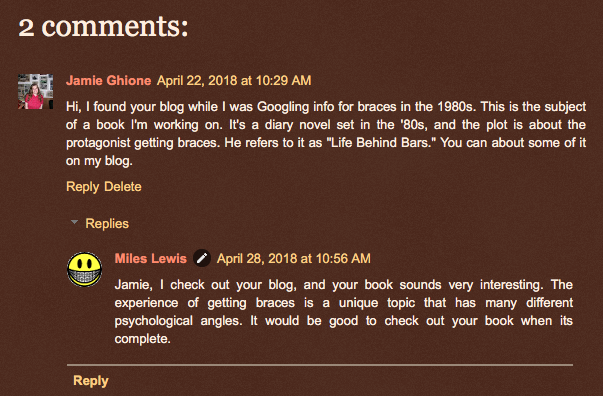 I think immediately of Anthony Michael Hall, who had real braces in all of those early and mid '80s movies. I did make some sci-fi references, such as A Wrinkle in Time (referencing a line from the story) and The Hobbit (the cat called Frodo). I guess it just slipped my mind to make any references to music or movies. The family doesn't have cable so making a reference watching MTV is out. What do any of you think of these suggestions? Honestly, it seems like there is maybe one week of summer we can actually enjoy. 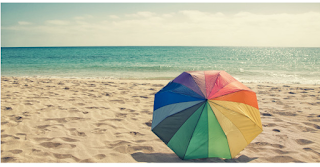 In June, everyone is thinking ahead to the July 4th weekend, or muttering something about how it “doesn’t feel like summer yet.” In July, the back-to-school commercials start. In August, stores are filled with backpacks, school supplies and fall clothes. Then there is the ultimate indicator of not-summer, which is the appearance of the Pumpkin Spice Latte, which millennial women mark on their calendars as the summer version of Groundhog Day. Already, people are Instagramming the hell out of their cups and rhapsodizing about sweater weather. Yet, as I write this, it’s currently 90 degrees. Summer is not over. We’ve got weeks left until September 22, the last official day of the season. Everyone, please, stop the rush to fall. Yes, I have seen accidents at precisely the spot where GPS-trusting tourists think, “Oh crap, this is the wrong lane.” I’ve nearly boycotted going to the grocery store at normal hours, because it’s just asking to be annoyed over multi-generational families walking 6-abreast down the frozen food aisle, marveling over how spacious this grocery store is compared to where the ones where they live. I’ve also had ugly, ugly moments where I tried to petition the removal of a seasonal resident of our apartment complex for regularly flouting our pool’s 2-visitors-per-apartment rule, bringing in upwards of 20 loud family members from every corner of the state to swim even though we live three miles from the beach. “It’s like living in a hotel!” they say, as they take yet another photo for Facebook and throw ice cream wrappers into the water while singing yet another verse of “Ring Around The Rosie” to highly embarrassed children. In each one of those photos, I’m scowling in the background. Maybe if we were all still part of the huddled masses of students trudging back to hallowed halls of learning like depressed turtles making their way to a cruel ocean, I’d believe differently. For them, Labor Day is a warning instead of a holiday. My heart goes out to them, their heavy book bags and their graphing calculators. The rest of you have no excuse. I don’t care if you’re technically drinking an ICED Pumpkin Spice Latte. Yes, iced beverages are generally summer beverages. But the premature adoption of pumpkin spice is decidedly autumnal and only makes you part of the problem. Same to you other adults (who don’t have kids) who are treating the school supply display at Target like a big tombstone to the summer of 2014. Stop saying that it’s now autumn. Instead, go do summer things. Now. And in the next few weeks. Go to the beach, go have a picnic, go wear shorts, go eat all the barbecue you want. Take a day off. Take a week off. Enjoy summer. It will be gone soon — just not now. I know there are still two weeks until Labor Day 2018, but in my neck of the woods, summer feels over for kids in school since they have bene returning this week. When I was in school myself, we didn't go back until after Labor Day in September. Even though I have no children, I know when school starts since I live behind one of the elementary schools in my town, and all the schools have kiosks that say when they begin again, along with other school announcements. As someone who once worked in retail, I have come to expect to see back-to-school items in stores beginning in July. Even if you're not in school and doesn't have kids, you can still take advantage of back-to-school sales. I've often gotten packages of pens on sale during this time, usually eating until the school supplies have been reduced to about 60 cents, just before Halloween items begin dominating the store aisles. And I'm expecting to see those any day now. Just yesterday, the Dollar Tree began putting out the orange boxes of bagged candy, including the candy corn. I felt tempted to buy some candy corn, but chose not to, not now anyway. 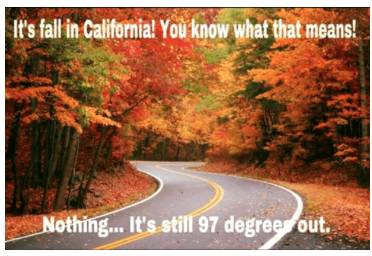 In my neighborhood and in most of California, it is often still 90 degrees even after the fall equinox hits. Not quite time to retire the shorts and flip flops for many people. Heck, it can even be this way at the beginning of October. This summer has been quite hot, so much so that I have been trying to to to the store and such before the heat gets intense, whenever I can do so. 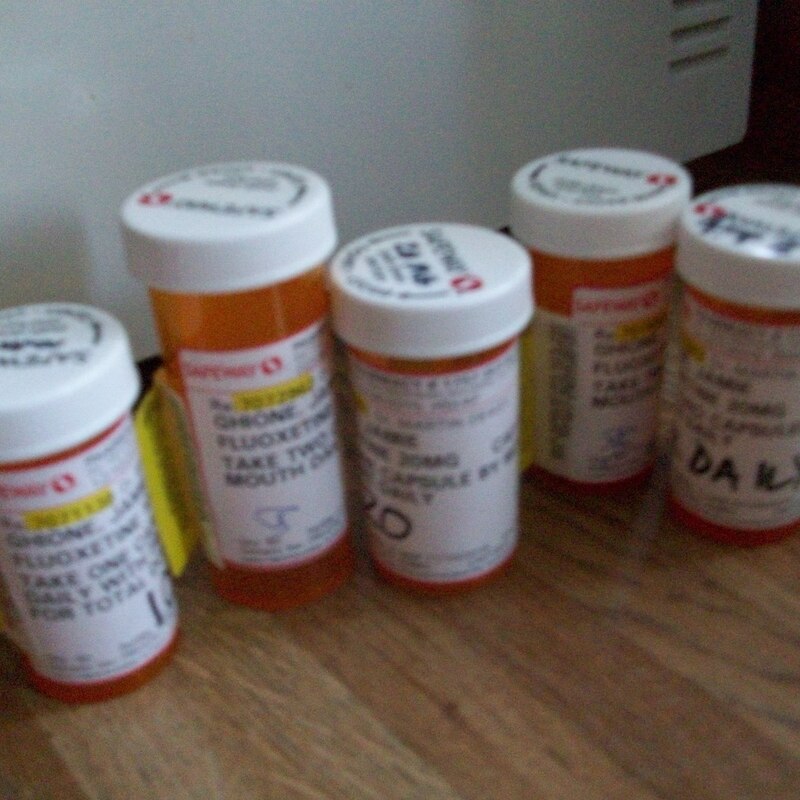 Yesterday, I had to wait until two o'clock to go to the store, since my prescription would not be ready until then. As I took my groceries, to the car, I felt a breeze, which was a relief. A man working at the store gathering carts from the parking lot remarked such as he came to get my cart. I said I usually hated going to the store at hat time of day, but I had to do so then. It was a lot less hot yesterday. Friday at work is our annual park day, postponed from last month. I now wonder how hot it will be then. 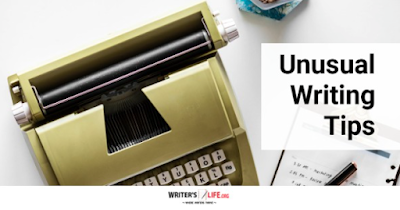 When it comes to writing advice, much of our time is spent learning how to get better, accepting how to take criticism, and hearing about what a struggle being in the writing game is. We read countless articles about how difficult it is to write, and how impossible it is to get published, it’s no wonder this can have an impact on how much we enjoy writing. But if we aren’t enjoying it, what’s the point in doing it? So here are some useful tips on how to better appreciate the process of writing itself. When it comes to writing it’s important to enjoy the process. If you keep focusing on the end goal of getting your book published, you could end up putting yourself under too much pressure or feeling like you are setting yourself an impossible task before you even begin. So focus on the process of writing, of the pleasure of crafting your story, and you’ll enjoy it so much more. 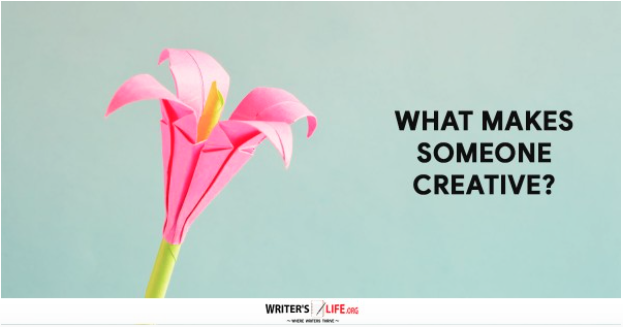 Writing is a beautiful way to express your creativity and create worlds and characters that are imaginative and powerful, that we can use as vehicles to express ourselves. Try to get lost in your world, to tap into your most creative and imaginative self and recognize how genuinely cathartic that can be. Remember writing is a process and if you try to do too much too soon, you’ll only end up feeling like a failure. You can teach yourself how to get better at writing, take pleasure in the practice, give yourself small goals and congratulate yourself as you improve and hit new milestones along the way. Writing will always be a struggle if you don’t make it part of your routine. While it may be tough at first, it is so worth trying to write every day or following a weekly writing schedule to ensure you keep up with doing it regularly. Once writing becomes part of your life, it will feel natural and relaxed and become so much more enjoyable as a result. Remember, the more you do something, the easier it gets. Instead of focusing on yourself and how much you are enjoying your writing instead why not try to focus on what you can do to make the reading experience the best it can be for your readers? This switch in perspective can make you feel as though you are doing something selfless, and in doing so you are bound to feel good about yourself and how your writing improves too. By following the above tips you can turn writing from a stressful and pressured experience into one that you enjoy, and since writing takes time and effort to do correctly, it’s essential that you do feel positive about it in the long run, and the more you enjoy your writing, the better and more natural it will become! 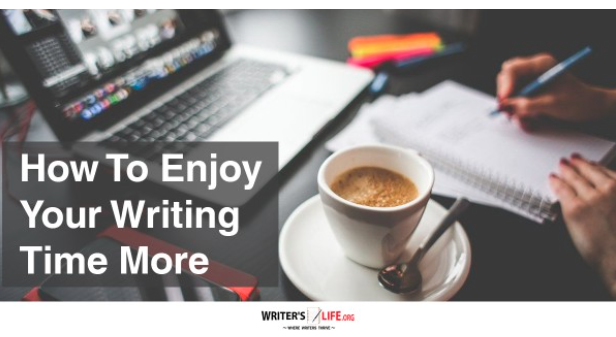 What do you do to make the process of writing more enjoyable? Share your comments here! 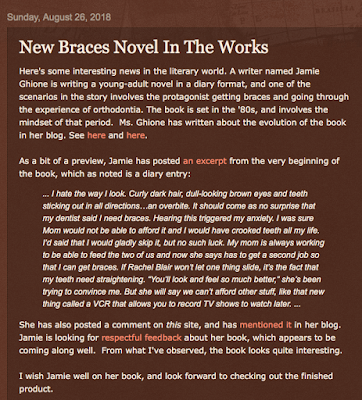 I must admit I have been slacking a little on writing, and even trying to blog here! I really want to get back on my diary novel and begin the sequel. It's weird how I can come up with an ice and be afraid to write it down (but most people get that way, I guess). I'll admit I find it somewhat easier to get lost in the world I'm trying to create that to get it written down sometimes. I should be enjoying this, and I do, but I'm just not doing it as much as I should be. But I'm going to try harder to make it happen. I now really need to push myself. I'm trying best to begin without worrying about how to end the story just yet. It will come in time. I saw this picture posted on Facebook yesterday. I just had to share it. 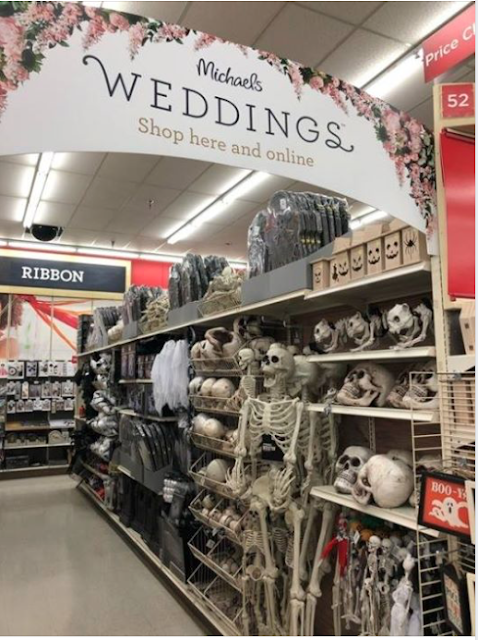 Are they perhaps suggesting decorating a plastic skeleton in wedding attire to display on your porch for Halloween? That could be interesting. FYI, I have not seen any Halloween stuff in stores just yet, but suspect it will be up any time soon. It's not been unusual to see such merchandise going up in August. But I'm already trying to come up with costume ideas, thanks to emails from Spirit Halloween. And I'm eager to check soon to find where the nearest of their temporary stores will be this year, even though it's been years since I've gone to and bought anything from one of these stores. I prefer to use clothing and accessories from thrift stores to make my own costumes, though I've made no decisions yet, since it's only August. 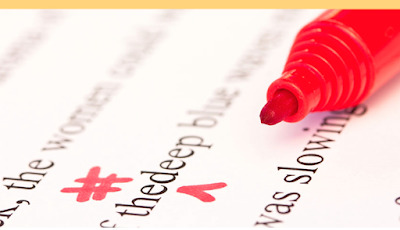 Getting tired of reading about the same old tried and testing writing tips? Looking to try something more unusual to boost your creativity and writing skills? Try these fantastic, unusual writing tips and see if they work for you! OK so it doesn’t have to be bungee jumping, but doing something that gets your heart racing and adrenaline pumping can be an ideal way to get those creative juices flowing. Try something different and write a script or a play. Doing so will really force you to focus on the power of dialogue to tell a story and can be a great way to learn how to make dialogue more effective in our work. Get old school and take a dictaphone with you wherever you go, it means you can easily record anything interesting you observe as well as general musings, or those bolt of lightening ideas that may strike at any time - without worrying your pen is going to run out of ink. Don’t just sit at your desk in your home office to write, get out and about and find some weird and wonderful locations to write in. You’ll feel inspired, and no doubt discover some exciting people and places while you are at it - all excellent material for your book. Set your alarm for midnight and wake up to write in the dead of night. You might find your sleepy state unlocks new ideas and allows your writing to flow, or just writing when everyone else is asleep could give you more focus and will enable you to be more productive too. OK while we shouldn’t advocate heavy drinking, lots of writers do find they are more creative if they settle down to write after a nice glass of wine! Of course, it doesn’t have to be alcohol that does it for you, anything that gets you into that relaxed and carefree state of mind will help your creativity flow. It might seem unnatural to start a story at the end, but doing so can give writers a fresh perspective and a new insight into the way they write. Why not give it a try? Every writer knows that reading can help inspire you and give you great ideas too. But have you tried setting some time aside to read before each of your writing sessions? Doing so could help you to get focused, get into the creative mindset and be inspired to write your very best. These unusual writing tips are well worth trying out; they’ll help you to gain a new perspective, experiment with different techniques and have fun with your writing too! Do any of these ideas seem unusual to you? Reading before you write certainly isn't an unusual one. I must admit I want to gt out somewhere to try writing, though I tend to forget about this idea whenever I go on a walk. It's so easy just to step outside to begin walking. An using a dictaphone, or a tape recorder--how I would love to do that if I could find one and some tapes, of course. I remember just recording nonsense onto a tape recorder. Perhaps I could dictate a whole story onto tape and then transcribe it. This might be easier than trying to write my ideas on paper, though I definitely would not make a habit out of tape-recording stories, as I can see myself getting annoyed from doing this many times. I'm definitely not brave enough to even think of trying to bungee jump, and wine is out for me. But if I wanted to, maybe I could try writing plays or scripts. I can easily wake up in the middle of the night without setting my alarm, though I have yet to try writing then. I now want to do it this way! Working backwards--I would never have thought of that one. Start with an ending and then work backwards as to how you came to that ending. How many of these ideas have any of you tried or now want to try? It’s so easy to make writing overly complicated, and one of the great dangers writers can come up against is trying to make their work expressive and creative without being overwritten. While one might think it is harder to make writing complicated than it is to keep things simple, because writers want their readers to see, to believe and to feel everything about their world and the characters within it, it is, in fact, all too easy to create overly complicated and even confusing prose. It’s easy to use too many words when trying to describe our characters and the worlds that they inhabit. We so desperately want the reader to imagine it the way we do that sometimes we ruin it by describing things too much, not allowing them to use their imaginations, telling instead of showing and giving huge descriptions instead of choosing the best words to explain succinctly and accurately what we need the reader to know. Change points of view over and over is only going to confuse your reader and possibly even yourself as the author! Stick to one point of view or switch character points of view when you being a new chapter. Going back and forth in time can add layers and depth to your story, however, if you choose not to keep time linear make sure you are smart and clear about it. If you keep jumping forwards and backwards in time, your reader will soon get confused and quickly lose interest. When you are writing, you should always have the reader in mind. Look at what you have written and be honest with yourself about what the reader needs to know. Kill your darlings, cut unnecessary words, paragraphs, scenes, chapters and even characters if they aren’t important to your story. Your book can’t go on forever; even the longest books have a finite amount of words, so it's imperative to make each one of them count. If you find yourself writing for the sake of it, or to draw out a scene to boost your word count you are almost certainly making your writing too complicated. Many writers fall into the trap of adding unnecessary adverbs after a character has spoken. Done too many times and this distracts the reader from the story. In most cases a simple ‘he said’ or ‘she said’ will do. These tips are ideal for writers looking to simplify and neaten up their writing. Writing that is direct, smart and interesting is so much more likely to capture readers attention than writing that is convoluted, complicated and overly descriptive. 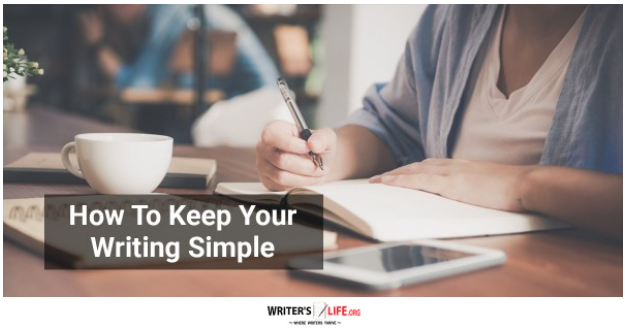 So next time you sit down to write, keep in mind these tips to keep your writing simple, straightforward and ultimately far more effective. This came just after I edited my memoir. There were many times when I found myself cutting down words in a sentence that I found unnecessary or repetitive, or combining two sentences to avoid overusing phrases such as "This was why..." I saw that I'd used that one quite a bit. Switching points of view was not an issue, since this is a memoir. Also true of a diary novel, since both are about one person. I haven't decided if I want to attempt writing from multiple points of view, which would be for an whole new novel. I've read a few such books recently and have found it interesting to see more than one character's view of the story. "What does the reader need to know?" I have asked myself that many times while going over the memoir. I just cut a chapter that felt was repetitive of what had been told in previous and subsequent chapters, but put moved of the information from that chapter into other chapters where I felt it would fit. I have been trying to neaten up my writing as well as tighten up some sentences and paragraphs, and trying not to be overly descriptive. These tips, however, came after I had begun doing such, but are still good to know. Yesterday during my memoir editing, it occurred to me to delete one chapter as I felt it was too repetitive of what I had already said. Some of the info contained in that chapter was moved to other chapters or to the epilogue. The page count and words count thus decreased even more. I've been printing the new chapters gradually since yesterday since I'm not sure how much paper I have for the printer and will have to get more soon. And I'm now wondering abut how much black ink I have right now.One of the things I get anxiety over while writing! As always, I can not be certain how much more editing I need to do. But I think I've written all I want to say on the matter. Now I want to get on with my next thing, the diary sequel. OCT 2 – Julie and I will post our September completed bingo cards. You can link up your bingo cards in this post. We will also be posting the August winner of the most squares in this post. For two or three days now, I have been editing my memoir even more. Some two weeks or so ago, I looked over for typos and other errors, but did not get around to correcting them on the computer until now. I did more today than I had done in previous days. I was up to nearly 10pm last night editing, and even in the summer I have not felt compelled to start up the late. The earlier I get up in the morning, the sooner I get tired and want to get to bed. I then decided that since I knew I'd be up early this morning, I get to editing as early as possible. I ended up beginning the process for today about an hour after getting up. As such, I got a lot of it done and now only have one chapter left along with the epilogue. I have asked myself how much to cut. It's my decision, of course, but today I did do a lot of deleting, including at least one long paragraph. I decided to edit some content that I felt I did not need. The word count and page number both have thus decreased. I've ben told the longer a manuscript is, the more turned off some people will be to reading it. But do I really need to follow this? the length should not matter more that the content, and I have been trying to delete any content I think the story could do without. Just another part of the process. I want to get this done by the end of this week, as I want to get it ready to send to the publishing contest at Blydyn Square Books. I'm still a little hesitant about this idea, but others have said I should give it a go. The deadline is at the end of September.